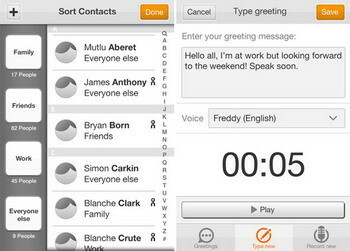 Orange Vallée has released an iPhone Visual Voicemail application called 'ON Voicefeed' which lets you customize your voicemail greeting message for different callers or groups of callers. So when your partner calls, they can be greeted just like the special person they are; when your clients call, they can be greeted professionally, while if your friends call, you can let them know which bar you are heading to. + SWITCH BACK TO PREVIOUS GREETING MESSAGE: You can record an on-vacation message, and know that when you return, you can flip back to your painstakingly well-recorded normal greeting message in one click. + DON’T HAVE TIME TO RECORD A GREETING? TYPE IT. And ON Voicefeed will turn it into a greeting message spoken in the voice of your choice. Great for when you want to say that you are available from 3pm, rather than 2pm as you originally thought. + MAKE GREETINGS EVEN MORE PERSONAL WITH VOICETAGS™. Add an ever-growing list of tags to your typed greeting message to make it even more personal. “Hi &Firstname” will greet your caller with an appropriate “Hi Ben”, “Hi Joanne”, etc. + NO LISTENING TO TIME WASTING MESSAGES: You get full visual voicemail to go straight to the messages you want to hear. You can even go to the website to listen to your messages. + SEE WHAT YOUR CALLER IS UP TO: You can see the Facebook or Twitter status of anyone who left you a message. Go to the website www.lifeisbetteron.com to set up your social network credentials. + ONE CLICK TO SWITCH BACK TO YOUR OPERATOR’S VOICEMAIL. If for some incredible reason you want to stop using ON Voicefeed and return to your operator’s voicemail, you can do this by clicking on the number in the contact “ON Voicefeed-deactivate” that we will add to your addressbook. This will automatically return your phone to its original voicemail settings. + MUCH MORE COMING. This is the first release of ON Voicefeed. Our roadmap is full of wonderful new features and improvements: add location to your greeting, answer directly from a message, message or call your correspondents for free. ON Voicefeed for iPhone is available for download FREE on the App Store in the Utilities category. 0 comments on "ON Voicefeed is an improved iPhone Visual Voicemail app"